“Sounds like – Drowning machinery screaming for help”. I will go with this description, given by Christian Dubé, who uses the moniker “Rei Rea” for his music. This album, bearing the heavy and burdensome title “hallah tatatahhh”, has six tracks in it, which demonstrate how the sound of Rei rea can send wet, tortured waves of heaviness that can overwhelm the listeners at certain points. The screams are just that, consistent hammering of distorted metallic beatings that keeps hallah tatatahh always on edge, always in distress. With “Behall”, the grand opening for Hallah Tatatahhh, all hell breaks loose. We are being thrown against distorted remains of what could be vocals, blasting through boiling turbulences of equally distorted sounds. Rei Rea put himself inside a huge engine, shouting his lungs out for help, and if you can hear this, you’re as stuck in this sonic hell hole as he is. This trap, a contemporary tale of Will-o’-the-wisp, is leading us into a different world than the one “Behall” was making us believe we’re headed to. From “Stream of the patron” onward, Rei rea wears a much more haunting mask, and industrial beatings, such as those found on “Teal”, are setting dark atmosphere on the post-rockish droning like the one we can find on “Stream of the patron”. If Behall was hostile, painful and suicidal, reaching deeper into hallah tatatahhh reveals more sinister, alluring and subtle sounds. 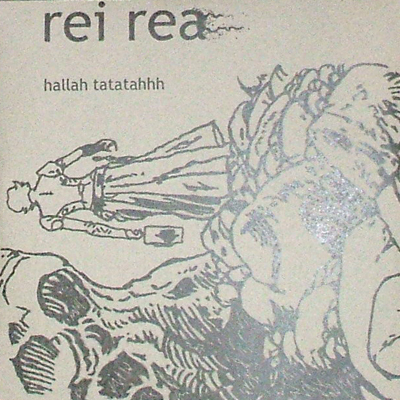 Massive and intense, Hallah Tatatahhh is a well worthy offering from Rei Rea. It delivers bestial vibration over emotional, almost subliminal sounds. And thus creating a tense, yet firm musical world. It ends with heavy and distorted guitar strumming that slowly fades out, leaving a dark fog behind it. Whatever dragged us into this world has left, and Rei Rea is leaving me alone in silence, holding a very good album in my hands.